The Civil Air Patrol, a 70-year-old nonprofit that operates as an official U.S. Air Force auxiliary and receives tens of millions of dollars in federal funding annually for search and rescue and other operations, won’t release findings of an internal investigation into allegations its historians stole donated artifacts. Volunteer historians in the Civil Air Patrol’s historical foundation have alleged for more than a year that the organization fails to properly account for uniforms and memorabilia entrusted to its care and that some of its historians have stolen those donated items. The Civil Air Patrol, a 61,000-member nationwide organization, investigated those allegations and completed an internal report in March, but refuses to make the findings public, contending that this is a private matter not subject to public scrutiny. The historical foundation uses the Civil Air Patrol’s name and is populated by its members. But the CAP’s leaders said the historical foundation is a legally separate nonprofit organization not covered by the Freedom of Information Act, a law that allows the public to obtain copies of government records. The Civil Air Patrol’s national commander, Maj Gen Charles L. Carr of Columbus, and senior officials at its national headquarters at Maxwell Air Force Base, Montgomery, AL, refused repeated requests from the Dayton Daily News and its lawyer to see the organization’s investigative report. Carr declined to discuss any details of the report. Rafael Robles, general counsel of the Civil Air Patrol, said that even if anyone had been disciplined, the organization would not disclose it. “CAP is under no ethical or legal obligation to provide the results of our internal investigation. Any findings and/or personnel actions taken are private and deemed confidential,” Robles wrote in an email responding to written questions from the Dayton Daily News. Richard Anderson, a Virginia state legislator who is a member of the CAP’s board of governors, its governing entity, said that releasing the CAP’s internal report would expose the identities of people who were interviewed for it. The Air Force, which oversees and provides operational funding for the Civil Air Patrol, said it does not have the report and isn’t entitled to it because the historical foundation is beyond the reach of the Air Force. The organization is heavily dependent on the Air Force, with its national headquarters and many of its state wing organizations maintaining their offices on Air Force bases. Through the Air Force, the Civil Air Patrol was allocated $37.7 million in federal funding this year for operations, maintenance, and aircraft and vehicle procurement. That funding does not extend to the CAP’s legally separate historical foundation, the Air Force said. The misappropriation, or at least undocumented handling, of donated historical items undermines confidence in the Civil Air Patrol, its historians said. Maj O’Brien said he accepted a family’s donation of the military footlocker, and uniform brass and silver decorations, of the late Gen John F. Curry, who served in the Army Air Corps, was the first national commander of the Civil Air Patrol, oversaw Dayton’s former McCook Field military facility and supervised the 1920s construction of Wright Field, now part of Wright-Patterson Air Force Base. The Curry items were supposed to have been displayed at the Wings Over the Rockies Air & Space Museum in Denver or at the Civil Air Patrol’s national headquarters, O’Brien said. The internal investigation also focused on what happened to a military uniform and hat donated to Lt Col James Shaw, now the Civil Air Patrol’s national curator, by Adair Nunnally Pizer, of Valdosta, GA. Pizer said the items had belonged to her late husband, George Winship Nunnally, a successful Atlanta businessman and early founder of the CAP and its Georgia Wing, and that she personally entrusted them to Shaw, of Leesburg, GA.
“We just wanted it to go into the collection of the Civil Air Patrol,” Pizer said last week. She said Shaw told her he arranged for display of the items at a CAP meeting on Jekyll Island, GA, and at Robins Air Force Base, GA. It isn’t the first sign of trouble for the Civil Air Patrol. A March 2011 inquiry by the Air Force inspector general, prompted by complaints from within the Civil Air Patrol, said the organization has suffered for years from turmoil and political infighting at its highest ranks. Most of the 25 witnesses interviewed for that report “blamed the turmoil on CAP’s acrimonious political culture” and said the organization had a patronage system and separate entities that competed for governing authority, the Air Force investigators concluded. They recommended that the CAP consider improvements to its governing structure. In 2007, the CAP ousted its then-national commander, Antonio J. Pineda, over allegations that another CAP member had taken tests for him at the Air Force’s Air Command and Staff College in 2002 and 2003. Pineda’s successor, Maj Gen Amy S. Courter, the CAP’s first female national commander, later complained of lack of cooperation from senior CAP officials in the organization she inherited. Most of the CAP’s ranks are volunteers, outside of a paid staff at the national headquarters. Despite the organization’s high-level turmoil, its membership is steady and it performs its missions capably, the Air Force inspector general’s report noted. 3. Revealing that National Curator, James L. Shaw would receive a verbal counseling. See Figure. 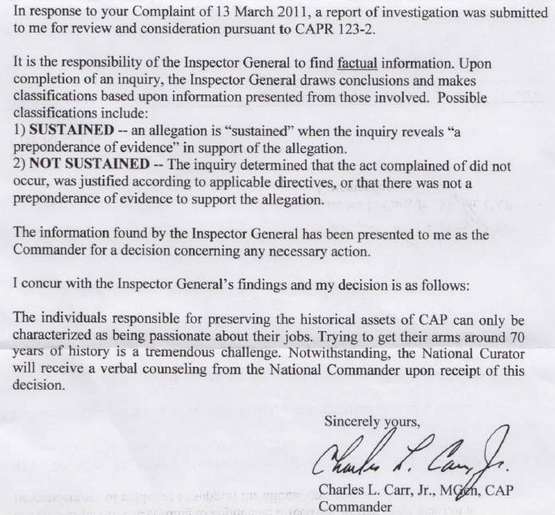 Carr’s letter acknowledging the findings against Shaw. [Editor’s Note: This story was originally reported by News of the Force followed by the Dayton Daily News. The Dayton Daily News story was published at the link below, but eventually removed. Be the first to comment on "Civil Air Patrol won’t Release Findings of Probe of Historians’ Complaints"
We wear bling and make-believe uniforms so people will see us and think we are “every day heroes” (NHQ website) and yet we are everyday frauds. Most of us are just duped into paying dues and buying expensive uniforms to further fund the NHQ nest. I am starting to learn this is one big falsehood. Yes, CAP does some good, some places. But now, every time I read of CAP’s involvement, I will want a second source. I no longer trust CAP leaders or the PR machine that is really pushing false news.